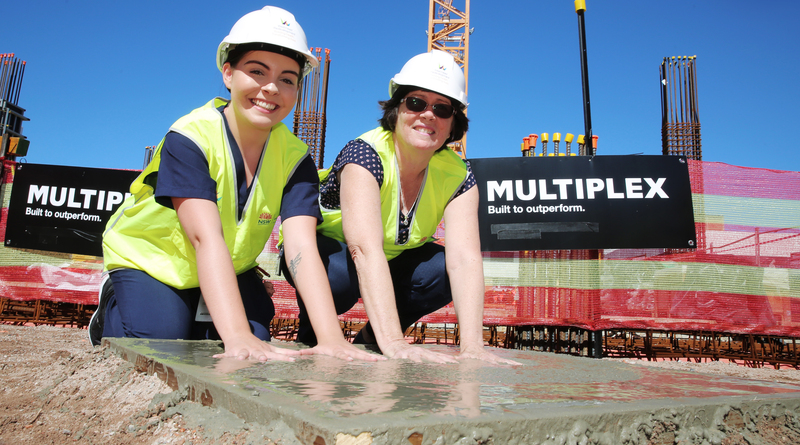 Westmead Children’s Hospital registered nurse Tanja Morris and Westmead Hospital registered nurse Jo Merkelbeach mark the the clinical services building concrete pouring. Hand prints in wet concrete have marked the start of work on the new central acute services building. Staff from Westmead Hospital, the University of Sydney and The Children’s Hospital at Westmead took part in the ceremony at the construction site. The hand prints are a reminder of the positive legacy staff from Westmead have left behind ever since the hospital was first built forty years ago. Westmead Hospital nursing unit manager Jo Merkelbach said healthcare had changed significantly during her career. “Since I first started at Westmead Hospital, patient numbers have increased, but the length of patient hospital stays have significantly decreased,” she said. There are more than 160 workers on the construction site and that number is expected to grow to around 850 as the project progresses. Westmead Redevelopment executive director Leena Singh said it was important to recognise the commitment of the existing and future Westmead workforce.